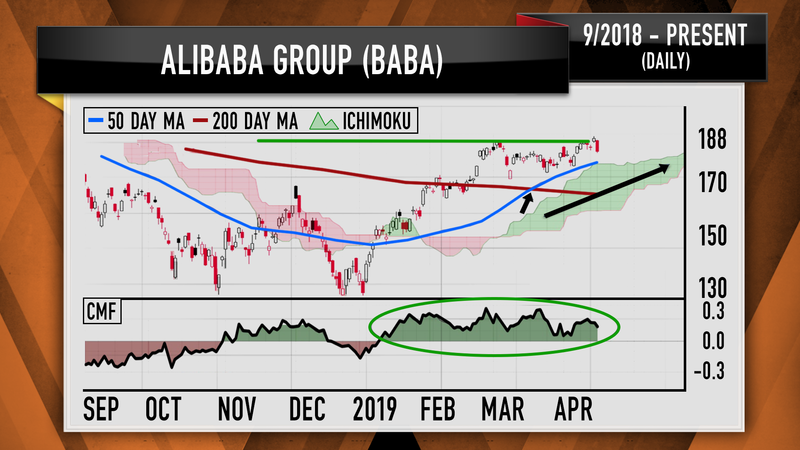 "Alphabet, Snap and Alibaba have been screaming higher ... [and] the charts, as interpreted by Bob Lang, suggest that all three of these internet stocks have more room to run," CNBC's Jim Cramer says. "I don't know if he's right, but it never hurts to have the charts on your side," the "Mad Money" host says. The Nasdaq Composite has been inching toward its all-time high, and a number of the biggest technology stock gainers could have more room to rise, CNBC's Jim Cramer said Tuesday. "Alphabet, Snap and Alibaba have been screaming higher, and as much as we hate to chase on 'Mad Money,' the charts, as interpreted by Bob Lang, suggest that all three of these internet stocks have more room to run," the "Mad Money" host said. "I don't know if he's right, but it never hurts to have the charts on your side," Cramer said. Shares of Google's parent have rallied more than 18% in 2019 and recovered all of the stock's losses since dropping off in early October during the fourth-quarter sell-off. 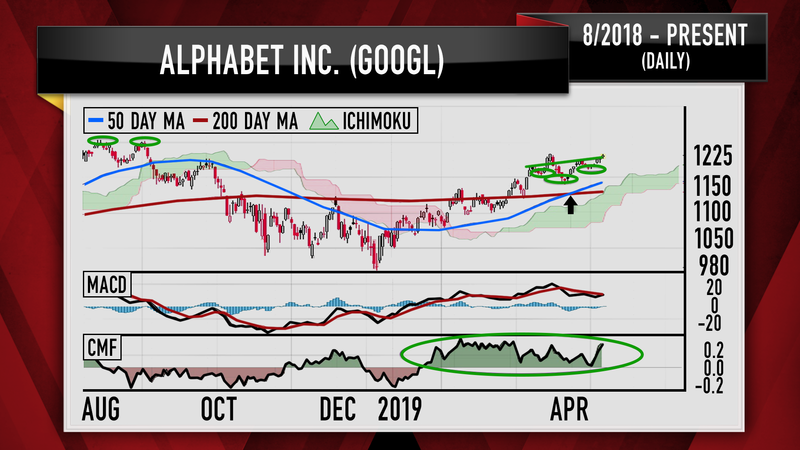 Alphabet's 50-day and 200-day moving averages have produced a golden cross, where the former average exceeds the latter average — a marker hedge fund managers love to see, he explained. 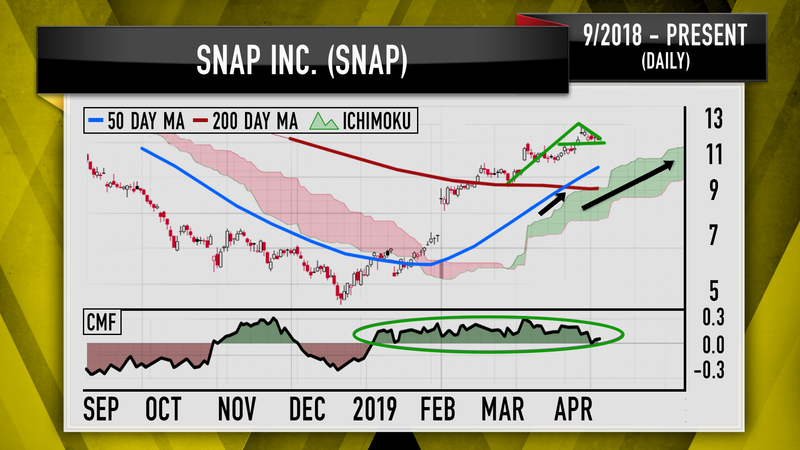 "The stock has recently been making a series of small inverse head-and-shoulders formation ... it looks like an upside down person. And this is one of the most reliably bullish patterns in the book," he said. "Put it all together and Lang thinks Alphabet is a $1,232 stock that can break through to $1,300 in short order. He's betting we break out [of] that barrier in not that long after the company reports earnings ... [on] April 19." Alibaba, often called the "Amazon of China," is edging closer to $188 — a key technical level for the stock. The stock has been a "powerhouse" since cratering from the high $160s to nearly $130 in the fourth quarter, Cramer said. "He likes that we got a golden cross last month ... and the 50-day moving average provides as a nice floor of support," Cramer said. "Put it all together and he could see Alibaba making its way back to all time highs [around] $210." Disclosure: Cramer's charitable trust owns shares of Alphabet and Amazon.com.